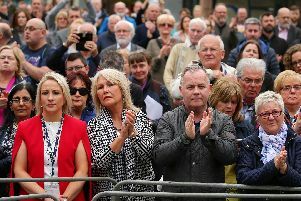 Hundreds of people gathered on Belfast’s Shankill Road this evening to remember the victims of five terrorist bombings carried out in the area during the Troubles. Organised as part of the Shankill bomb 25th anniversary commemorations, the Walk to Remember event saw local people gather at the sites of five atrocities along the road – the Balmoral Showrooms (1971, four killed), Bayardo Bar (1975, five killed), Frizzell’s fish shop (1993, nine killed plus the bomber), Four Step Inn (1971, two killed) and the Mountainview Tavern (1975, five killed). A short religious service was held at each site and the names of those killed were read out before wreaths and flowers were laid in memory of those who lost their lives. At the scene of the 1993 Shankill bomb, family members laid flowers together and comforted each other as they remembered those murdered in the IRA attack 25 years ago. Charlie Butler, who lost his niece Evelyn Baird, her partner Michael Morrison and their seven-year-old daughter Michelle Baird that day, said the community’s show of support was comforting for the families. “It has been devastating for 25 years and it’s still devastating, but events like this let us know that people still feel for us and are still there for us, so it does help,” he said. Charlie Butler, who lost his niece, her partner and their daughter in the 1993 Shankill bomb, was among hundreds who took part in the Walk to Remember event on Monday evening. Rev Canon James Carson, rector of St Michael’s Church in Craven Street, took part in the event, reading out the names of those killed in the Bayardo Bar bombing. “We hope this is part of the healing process for the families of those who were killed in the five bombs on the road – four in the 1970s and the Shankill bomb in 1993,” he told the News Letter.